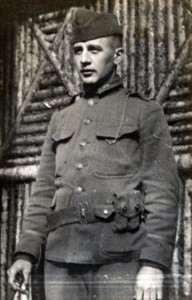 Stephen Taber, a contact made through the Western Front Association – East Coast Branch in the United States, has written this latest guest post about the diary of his second cousin, who served with the United States 42nd Division—The Rainbow Division. The edited diary has just been published by McFarland. Second Lieutenant Christopher Timothy, Company K, 3rd Battalion, 168th Infantry. He died of wounds on July 28, 1918 having been hit by machine gun fire near the River Ourcq. He is buried in Aisne-Marne American Cemetery, Belleau, France. The ‘Rainbow’ Division, the 42nd, secured its name from a comment made by its future chief of staff—then Major Douglas MacArthur—that because of its composition of elements of National Guard units from 26 states it “would stretch over the whole country like a rainbow“. One of the Division’s junior officer was Lieutenant John Taber, my second cousin. He had published a two-volume history of his regiment, the 168th (Iowa), in 1925 but he had related only a few accounts of his personal war experience to me before he died. One was that he could still smell over three hundred dead horses. Another was nearly bumping into President Wilson in a revolving door in Paris. John passed away in 1986 at the age of 91 and left me his hand written diary of the Great War. After a very long time I finally read his story and decided to edit it and see if it could be published. After describing the voyage across the Atlantic, he goes on to relate his experiences in officer school in France, in the trenches, in open combat in the latter stages of the war, and, finally, in Germany with Third Army; he describes some harrowing experiences. There are also fascinating tales of champagne dinners, interesting billets, and leaves to Paris and the Riviera. It was an honor and a great pleasure to bring John Taber’s story to light. 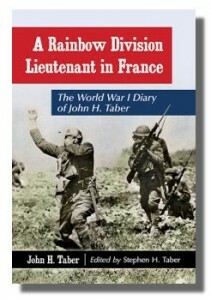 John H. Taber graduated from Columbia University in 1917 and was commissioned as a second lieutenant in the 168th Infantry (Iowa) of the 42nd ‘Rainbow’ Division in World War I. In 1925 he wrote ‘The Story of the 168th Infantry‘ in two volumes, published by the State historical Society of Iowa. He died in New York City in 1986. Stephen H. Taber (Editor), the second cousin of John H. Taber, is a financial specialist on Brazil. He lives in Boston, Massachusetts. This entry was posted in Books: Writing, Publishing & Reviews, First World War, Guest Posts on October 31, 2015 by Nick Metcalfe.